Jon Callaghan is a founding partner of True Ventures. I spend a lot of time in board meetings. Specifically, private company startup board meetings. Rooms filled with some of the most talented, bold, daring and dedicated people on the planet, devising solutions to some of the economy’s toughest problems. More often than not, however, most of these board meetings fail. Despite the good intentions and great experience in the room, the painful truth is that precious time and energy is frequently squandered by directors and startup CEOs. Startup CEOs assume board directors expect them to “report” on their business. Directors assume CEOs know how to run board meetings. I’m proposing a solution that I call the Board Triangle. This model is designed to give all startup CEOs a guide for topic and time management for board meetings. It’s an active map to be used before, during and after the meeting to get you where you need to go. I’ve used this framework in a handful of board meetings since this fall, tested it with lots of CEOs and professional board members and screened it at the Lobby conference in October. This post includes suggestions and feedback from many people and, while no model is perfect, this one works well. Of course, boards do lots of other administrative things, like approve stock options for employees, leases, large agreements, etc., but this post focuses on the non-administrative time spent in a board meeting. 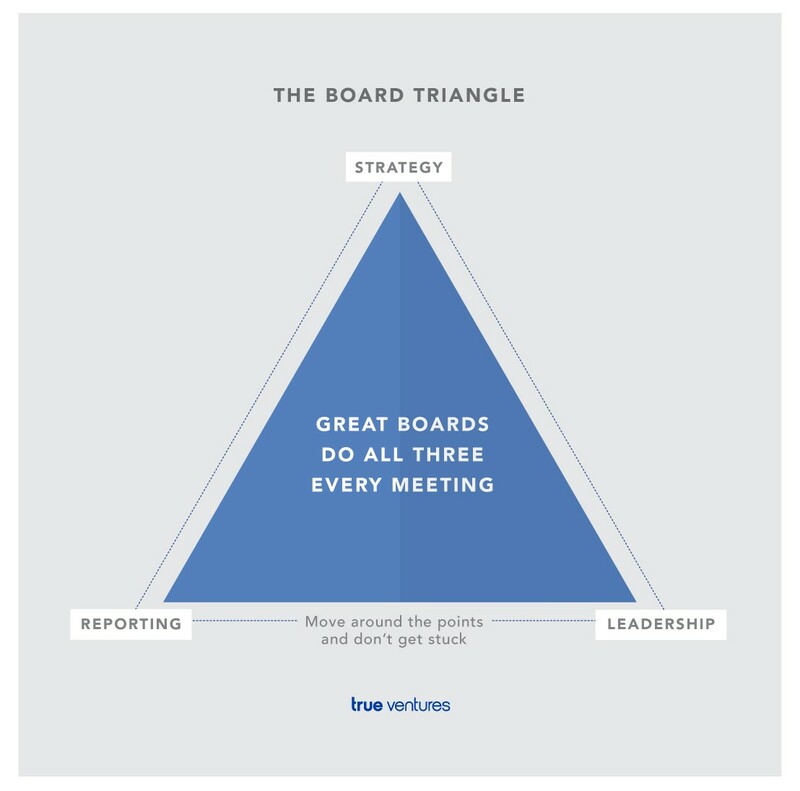 The “points” of the Board Triangle are strategy, reporting and leadership. In this post I describe what each point means and how to use the Board Triangle to create a new model of board interaction. Use this Board Triangle when planning the meeting. In the room, with your board, be explicit and thoughtful about the three points of the Board Triangle. Put it on a whiteboard so everyone knows what’s on your mind. Spend the first 15 minutes of each board meeting in a tight “executive agenda” session. This is you and your board. Use the time to set the context and agenda for the meeting (there is more time later for deep dives). Be watchful to not get bogged down solely on one point. Move around the Board Triangle. Evaluate your meeting using the Board Triangle. Did you spend too much time on reporting and no time on leadership? Be tough on yourself. It matters. Strategy work is what it sounds like. Your board is a great resource for strategic perspective (be smart about getting experience in the room). Strategy topics range from ideas around competition, pricing, talent, product differentiation, distribution, partnerships or BHAGs that you and the team envision. You should come into a board meeting with 1-3 strategic issues to mention, but I coach CEOs to spend real time talking through only one “big” strategy question. Let your board help you. The board can add an outside set of eyes to any problem. Great boards can make you and bad boards can kill you. The nature of the issue is often less important than the “exercise” you get. Boards build muscle when they work together, and muscle is required across your company for the journey ahead. In the process of discussing various strategic topics, the board learns to work together and trust one another, which is absolutely critical to your long-term success as a CEO or founder. When it really counts, on a “bet the company” or a “save the company” situation, you need your board to work together to solve the problems. In my experience, boards fail in the clutch if they haven’t had ample time to “train” together. Board duties create expectation on behalf of directors to “stay informed.” This is a legitimate expectation, but I would challenge you as a founder and CEO to flip it on its head. Instead of seeing the board meeting as the time for reporting out to your board, require that your directors arrive fully briefed. Board time is valuable — just witness how hard it is to get a board in the same room and get people focused. The enormous mistake made by most startup boards is to take up an entire meeting reporting out to your board. Many founders actually spend time reading bullet points from PowerPoint or Keynote to the directors. Huh? Here you have an incredible resource at your disposal and you choose to use the time reading bullet points to them? A great board meeting is a working meeting. My best practice is to advise the CEO to send out as much info as possible or desired a day or two in advance and require the board to come prepared. Then, in the meeting, limit one-third of the time to “updates and reporting.” Be strict. Always include questions on the areas not covered in the deep dives. One CEO I work with asks for questions on the material in advance. So he distributes the deck in advance and requires board members to email questions for the update section. This tactic is super effective. Another CEO I work with sends a slide deck as well as a very lengthy prose narrative, sort of a “letter” to the board about what’s on his mind. This letter is usually 4-8 pages (though it has been as long as 25 pages), and it’s dynamite. By the time we get started, the board knows exactly what the company is working toward, the issues on the CEO’s mind and how he is feeling about the company overall. I love this letter. The third point of the Board Triangle is leadership. The board can help you become a better leader, and also support your leadership of your team in board meetings themselves. You can specifically bring members of your team in for different parts (or all parts) of a meeting. Essential knowledge-sharing happens when your head of product runs a demo, or your VP of Sales works the pipeline or the CFO gives a cash forecast. This is good for sharing the expertise of your team across your board (and vice-versa), and these are also critical relationships to establish. Bringing your team into the board meeting can be both a huge motivator and an effective way to lead. You demonstrate transparency, expose your team to other aspects of the business and allow credit to be earned and rewarded by the board. As a director, I always value seeing the team in action — not only in reporting to me, but also in talking amongst each other. This is how a board gets a temperature gauge of the real cohesion of a team, the corporate culture, the magic. Just remember to balance across the points of the Board Triangle. Too much about sales and/or too many demos can get in the way of the other meeting objectives and opportunities. Having the entire team in the full board meeting is an enormous resource drain, as well, and you can fall into traps of politics pretty quickly here: “Why is he/she in the meeting and I’m not.” Include team members with care and good reason. Be generous, but judicious. The “leadership” point of every Board Triangle also serves as a CEO’s outlet and opportunity to have an unfiltered discussion with the board. We’re all just human, and leadership can be lonely. Using part of the meeting for “venting” or expressing frustrations and challenges can be useful. CEOs need an outlet to discuss what’s bugging them, and boards can offer new perspectives. There are lots of creative ways to do this. One CEO I work with has a visual slide up front on his mood expressed as a “meter” — sort of a gas tank of emotion. The needle points left if he is feeling discouraged and it points right if he’s feeling optimistic. Another team makes the first slide of every board deck a series of icons representing the company’s “daily emotions.” Many use photos or customer quotes up front to show the meaning, impact and “why we do this” to the board. There are lots of good ideas to get the board to feel your emotion. A great board meeting is a working meeting. For some people, the real work of a board can feel messy. This is because a good board meeting in a startup is not one that sticks to a carefully manicured agenda. Startups are too dynamic for this, so let go of the agenda as needed so your board can “work.” I approach every board meeting as Go time. It’s not “dress rehearsal,” and I expect everyone in the room to bring their 100 percent. Great boards can make you and bad boards can kill you. It’s a powerful part of your business that many CEOs and founders often overlook or fail to optimize. The best boards make you a better CEO, team and company. The best boards act as an extension of you and your team, and they work hard for you. Communication is frequent and easy, never staged and stilted. In your meetings, try to stay within the Board Triangle. In my experience, you’ll build a trusted, transparent and valuable relationship with your board.